Our Carnival Booths are the best in Central Florida. Our steel framed booths are heavy duty 8 foot booths with high quality vinyl roofing, fronts, sides and backs. These Carnival Booths are beautiful. Pop up carnival tents do not compare to the quality and finished look of these carnival booths. Order the best for your event. The shiny high quality vinyl will hold up easily to multiple users at your events. Wind is not an issue with booths. Each section is durable and sturdy. Leaning on the front of the both is not an issue. Our fronts are detachable so you can use our booths as an open tent or easily place the front back on to create a full Carnival Booth. 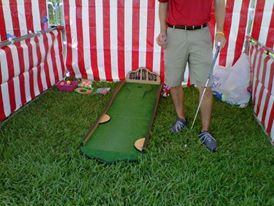 Every carnival booth comes with a matching table and table cover as well as a game. Some games will fit two to a booth. Prizes are available upon request.